Meccanica H7 has chosen a mission: innovation. The search and the development of new solutions has become a spread motivation in all phases of the productive cycle: designing, production, assembly and assistance. This choice makes Meccanica H7 a company able to offer indeed a complete service. Not only in terms of available competence selection, but above all for the ability to propose and present new solutions before the customers need it. 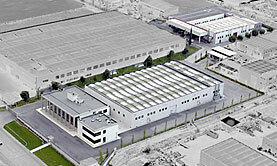 In over 30 years we have dedicated our work to allow the realization of our customers’ ideas. Meccanica H7 has conceived, developed and built machines and productive systems destined to satisfy different markets in different countries. The knowledge and the experience of Meccanica H7 are a unique value for customers and partners, thanks to a continuous predilection for the research, the industrialization, the costs control and the assistance in all the markets. Meccanica H7, in its sector, has a great competence in the creation of a vast range of solutions and technologies intended to different productions for destinations and volumes. Meccanica H7 offers an incomparable flexibility in the field of the industrial production, supplying both prototype systems and mass-production machines as proof of the high versatility and reliability acquired in the time.